Set/5 Picks In Rustic Style for Miniature Fairy Gardens. 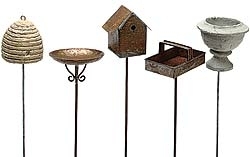 Set includes Birdbath, Birdhouse, Trug, Urn, and Bee Skep. Approx 7.25" Tall with Pick.